How the Muslim taxi driver became a bogeyman in Arizona’s religious freedom debate. 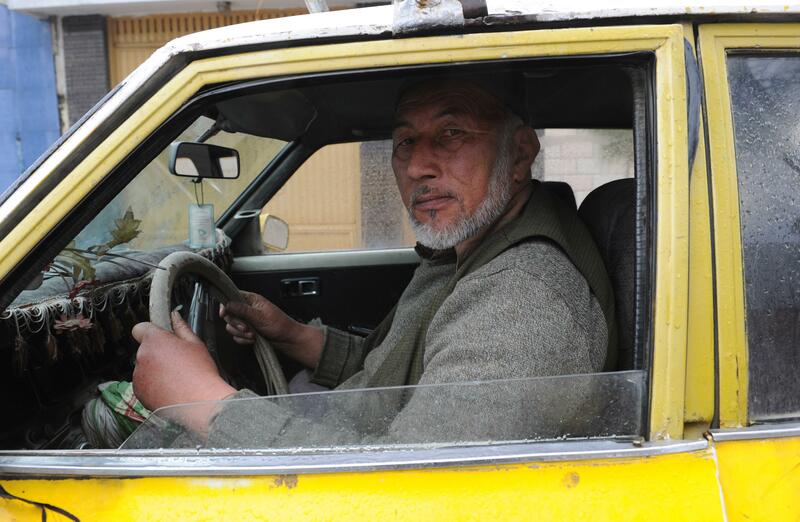 An Afghan taxi driver in 2010. Last week, I wrote about the use of Muslims as bogeymen in the campaign against Arizona’s religious freedom bill. The bill would have shielded businesses from discrimination suits, as long as they were acting on religious beliefs. Everyone understood that the bill would have allowed conservative Christians to refuse services for a gay wedding. But politically, that wasn’t a strong enough argument against it. So opponents raised a different scenario: A Muslim proprietor—typically, a taxi driver—might refuse services to a woman or to a person of a different religion. Technically, the elements of this charge are correct. The scenario was stereotypical. It did give way to an anti-Muslim narrative. And, as far as I can tell, the scenario was introduced by the ADL’s letter and testimony. But the demand for an apology is unwarranted, in my view, because the ADL didn’t put these three elements together. They came together over the course of the Arizona fight, through the intercession of other players. Many of the innovative messages that change politics—the idea that gay marriage is pro-family, for instance, or that mass surveillance by the National Security Agency represents liberal big government—aren’t the work of a single strategist. They’re the product of multiple actors sequentially modifying an idea. In the case of abortion, I wrote a whole book about how this happens. The idea of personal freedom, which liberals loved, was gradually transformed by strategists and politicians into a message that resonated with conservative voters: the idea that the government should stay out of the family. That transformation came with policy concessions: parental notice and consent laws for minors, and severe restrictions on public funding of abortions. An employer could raise SB 1062 as defense to an employee’s equal pay claim … arguing that his or her religious beliefs require that men be paid more than women. A Muslim-owned cab company might refuse to drive passengers to a Hindu temple. That’s a pretty long list. The Muslim scenario came last. The hypothetical target of discrimination was Hindu, not Christian. And that scenario was preceded by one in which a Christian discriminated against Muslims. For these reasons, I think it’s unfair to accuse the ADL of pushing a Muslim stereotype. I wish I had quoted more of the letter to make this clear. I linked to the hearing video in which the letter was read aloud (skip to minute 46), but in retrospect, that wasn’t enough. I’m posting the whole letter here as a PDF, so you can read the full context for yourself. What happened in Arizona, evidently, is that as other players picked up the Muslim scenario, they removed these mitigating factors. They sharpened it for political effect. The Arizona Republic, in its Feb. 20 editorial against the bill, made the Muslim taxi driver its opening example and changed the driver’s hypothetical victims from Hindus to women. Phoenix news station KTAR did the same in its Feb. 23 report on criticisms of the bill. CBS News changed the victims in the scenario to Jews. Other media outlets changed them to Christians. You might find this exploitation of Islamophobia disgusting. You might find it clever. You might conclude that it’s both. Was the political payoff worth the social damage? I’ll leave that question to you. Either way, it’s important to understand that the dissemination and transformation of the taxi driver scenario, like other tropes and characters, is a collective, incremental process. The blame, like the credit, must be shared.